But Dacor has always been and continues to be focused on the products themselves, and with that in mind they’ve announced their brand-new Dacor Modernist Series. Billed as a counterpoint to their Heritage Collection, which features older models and comes only in stainless steel, the Modernist Collection is geared toward the modern entertainer. It's features cater to customers who appreciate modern technological advances and sleek, thoroughly contemporary looks. And my, what looks they have. The Dacor-exclusive graphite stainless steel finish on the Modernist line appliances is simply stunning, bringing stainless steel into the future with a dark, velvet-smooth look that’s designed to make a powerful impact without being a distraction. Using the same high-end control panels as the Heritage Collection, each Modernist appliance revisits every other visual element from the ground-up, resulting in truly stunning visual statements. 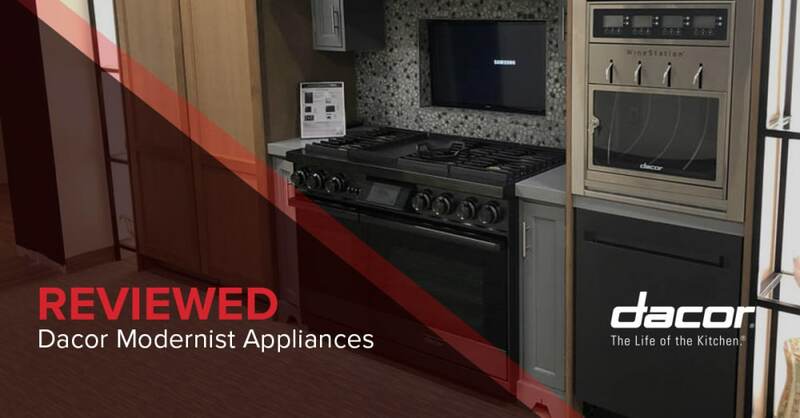 But an appliance is only good as its features, so with that in mind it’s time to take a look at the three flagship appliances of the Modernist line—the Modernist Range, Modernist Dishwasher, and the Modernist Refrigerator. In addition to being visually striking (and offering the choice between black or brass cooktop caps), the Modernist Range offers a dazzling list of features that will have any potential customer weak in the knees. Dacor is the only brand to offer auto connectivity between the cooktop and vent via Bluetooth, allowing for smart and automated ventilation when cooking. Meanwhile, the 4-point convection dual-stacked brass burners are top-of-the-line, complemented by gorgeous Illumina knobs and ambient lighting. The diamond-like triple carbon coating ensures long lasting durability, as does the ceramic coating on the included griddle. Now boasting dual-stacked convection fans as opposed to the Heritage series’ single fan, the Modernist Range also allows for the running of a simply absurd ten timers at the same time, for extensive cooking projects in any thoroughly modern kitchen. Like all Modernist Appliances, the range comes with an included two-year warranty, plus a free third year for customers who register their appliance with Dacor. Used more than any other appliance in the kitchen, a refrigerator can’t only be powerful—it must also be intuitive, allowing each user to organize and utilize it based on their personal preference and unique style. It begins with the size variations, offering 18”, 24”, 30” and 36” freezer sizes with 24”, 30”, and 36” hinge variations. Available in either stainless steel or graphite steel with custom panels, customers can also select whether they’d prefer push-to-open functionality for a minimalist look or classic handles for quick access. The fridge interior is a stunningly beautiful stainless-steel finish with true glass drawers (as opposed to plastic), complemented perfectly by stainless steel lighting that gradually increases and illuminates each and every drawer. The control panel is completely flush with the refrigerator surface for a clean look, and its located inside a storage drawer for protection and streamlined visuals. The 30” option offers a massive 18 cubic feet of capacity, while each model offers a three-zoned bottom drawer and internal water dispenser as opposed to the Heritage series’ external option. A heating kit isn’t necessary when pairing, using only what’s known as a “Yoda Loop” that requires nothing but a trim kit. Dacor is also the only brand to offer a dual ice maker—each Modernist refrigerator creates both cocktail ice (two times the normal size) or standard ice, each available at the push of a button. The column-style fridge option features internal cameras the show the interior shelves whenever the doors are closed, allowing for quick visual access without wasting energy. Dacor’s 10X food preservation system is top of its class, and Dacor proved their unparalleled vision for the future by winning a highly-respected EPA award for their R600A refrigerant. Dacor was the first brand on the planet to use this refrigerant, and by 2020 it will be required for every new refrigerator in the USA. Often the underappreciated workhorse of any kitchen, the dishwasher in the Modernist collection may well become your new favorite appliance. It features wall-to-wall technology with five extending arms that reach the very back and every corner of your dishwasher for a thorough, all-over clean. Condensation drying ensures that you’re never left with dripping dishes post-wash, and a 3rd rack offers plenty of room for all of your soiled dishware. The stainless steel and graphite options mean you can pick based on your own personal visual style. Overall, it’s as beautiful as it is powerful, and it’s only available from Dacor. While Dacor’s Heritage collection still offers high-end kitchen appliances that bear the signature Dacor quality, their new Modernist series is in a class of its own when it comes to style, beauty, power, features, and overall functionality. In combination with their renewed efforts in marketing for 2018, the Modernist series is set to vault Dacor even higher in the stratosphere of highly-respected luxury appliance manufacturers.